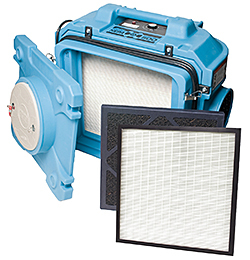 The DefendAir HEPA 500 air scrubber uses a HEPA filter rated at 99.97 percent efficiency on 0.3 micron particles and larger, plus a pleated paper pre-filter. It becomes a three-stage air filtration unit with an optional Stage 2 DOP filter. Optional activated carbon pre-filter. Variable speed control from 250 to 500 cfm.